A duplex house plan has two living units attached to each other, either next to each other via townhouses or above each other like apartments. By contrast, a building comprising two attached units on two distinct properties is typically considered semi-detached or twin homes but is also called a duplex in parts of the Northeastern United States. The term "duplex" is not extended to three-unit and four-unit buildings, as they would be referred to with specific terms such as triplex and fourplex or quadplex/quadruplex. Because of the flexibility of the term, the line between an apartment building and a duplex is somewhat blurred, with apartment buildings tending to be bigger, while duplexes are usually the size of a normal house. British English usage refers simply to the number of levels within an apartment unit with duplex indicating two storeys (traditionally this was referred to as a maisonette) and triplex for three. A semi-detached house would never be referred to as duplex in the United Kingdom. The word "duplex" is occasionally mispronounced with the last letter silent due to multiple misperceptions: (1) that the English word came from French, (2) that an English word naturalized from French needs to retain the French pronunciation, and (3) that the terminal -x would be silent in French. But (1) this English word came straight from educated English speakers' use of Latin (not by way of French), (2) most English words that came from French words use naturalized pronunciation, and (3) the French pronunciation of the French cognate ends in /ɛks/ anyway. A side by side duplex also known as a semi-detached house. In dense areas like Manhattan and downtown Chicago, a duplex or duplex apartment refers to a maisonette, a single dwelling unit spread over two floors connected by an indoor staircase. Similarly, a triplex apartment refers to an apartment spread out over three floors. These properties can be quite expensive and include the most expensive property in Manhattan as of 2006 (according to Forbes Magazine), a triplex atop The Pierre hotel. In this context, an apartment locating on one floor only may be called a simplex. In the United Kingdom, the term duplex is more often used by property professionals such as architects and estate agents and refers only to a flat or apartment on two floors connected by an inner staircase though many newer apartments have open-plan designs including mezzanines. The traditional layout is normally called a maisonette, indicating a 'house-like dwelling' raised above the ground or street. In Australia, a duplex is often considered a residential building containing two homes that share a common central wall. As such they are usually a mirror image of each other in layout. Also referred to as a maisonette in South Australia. A paired home is two homes that share a wall and have opposite side entries. The whole building is designed to look like one single larger home. Unlike a front to front duplex, the paired home helps provide more privacy for the homeowners. In urban planning, the term duplex is used more specifically. Major Canadian cities sometimes use the term duplex to refer specifically to a building with one unit built above another. Edmonton defines 'Duplex Housing' as "development consisting of a building containing only two Dwellings, with one Dwelling placed over the other in whole or in part with individual and separate access to each Dwelling". Calgary defines Duplex Dwelling as "a building which contains two Dwelling Units, one located above the other, with each having a separate entrance". Toronto proposes in their new Zoning Bylaw to define 'Duplex Building' as a building that has only two dwelling units, and one dwelling unit is entirely or partially on top of the other dwelling unit. Halifax defines Duplex Dwelling as "the whole of a dwelling that is divided horizontally into two separate dwelling units, each of which has an independent entrance". Other major cities use the term duplex, but for dwelling units. Dallas defines the term duplex as "two dwelling units located on a lot". 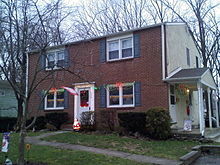 Philadelphia defines a duplex dwelling as "a dwelling occupied as the home or residence of two (2) families, under one (1) roof, each family occupying a single unit", a definition that excludes a pair of twin (semi-detached) houses, two dwellings separated by a firewall that extends above the roofline. Other major cities do not use the term duplex in their zoning or land-use bylaws. San Francisco and Vancouver use the term Two-family dwelling. Winnipeg uses the term Dwelling, two-family. The definitions of these terms do not specify the physical relationship between the two dwelling units in the building. In cities such as Buffalo, Detroit and Chicago the term Two-flat is used and defines it as a "residential building that contains 2 dwelling units located on a single lot. The dwelling units must share a common wall or common floor/ceiling." Where cities do not define the relationship of the dwelling units to one another, units may be built one on top of the other, or one beside the other. The latter arrangement is more specifically referred to as a semi-detached building. Wikimedia Commons has media related to Twin houses. ^ "Benefits of a Duplex House Plan". thehousedesigners.com. Retrieved 27 June 2018. ^ Most Expensive Homes In The U.S. 2006. Forbes.com (23 June 2006). Retrieved on 2011-06-07. ^ "What is a duplex & what's it got going for it? - realestate.com.au". 16 April 2015. ^ "Calgary Land Use Bylaw" (PDF). Archived from the original (PDF) on 7 August 2011. Retrieved 23 February 2018. ^ "Proposed Toronto Zoning Bylaw". Archived from the original on 16 July 2011. Retrieved 23 February 2018. ^ "Halifax Mainland Land Use Bylaw" (PDF). Archived from the original (PDF) on 6 April 2016. Retrieved 23 February 2018. ^ "Dallas Zoning Code". Retrieved 23 February 2018. ^ "File Failed". Archived from the original on 27 March 2009. Retrieved 23 September 2008. ^ "Vancouver Zoning and Development Bylaw" (PDF). Archived from the original (PDF) on 13 June 2006. Retrieved 23 February 2018. ^ "San Francisco Planning Code". Archived from the original on 21 October 2008. Retrieved 23 February 2018. ^ "American Legal Publishing - Online Library". ^ "Karen Hanover". Retrieved 5 March 2017.